Senate Democrats announced their intention to "hold the floor"
On Monday, Senate Democrats announced their intention to "hold the floor" for the next 24 hours to protest President Trump's Education Secretary Nominee, Betsy DeVos. Her nomination has drawn fierce opposition from teachers' unions and others. WASHINGTON — As she faces what promises to be the closest vote ever for a cabinet nominee, Betsy DeVos, President Donald Trump’s choice for education secretary, is also the most well-known — and in some sense the most notorious. 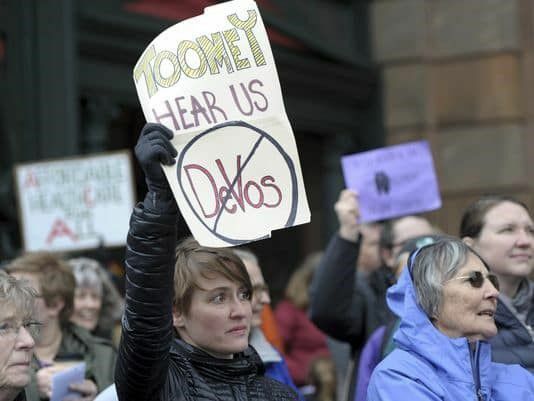 Spoofed as clueless on Saturday Night Live last weekend, she has been the subject of Internet memes and angry teacher protests nationwide since her Jan. 17 Senate confirmation hearing. Observers say the Republican mega-donor and Michigan native has tapped into anxieties about the new Trump administration — and with two key Republicans last week vowing to vote against her, she is a ripe target: the first Trump nominee who could potentially be defeated. Democrats, who have gathered exactly 50 votes against her, need just one more to defeat her nomination Tuesday. Absent a 51st vote, Republicans must rely on Vice President Mike Pence to cast the tie-breaking vote — the first ever for a cabinet nominee.